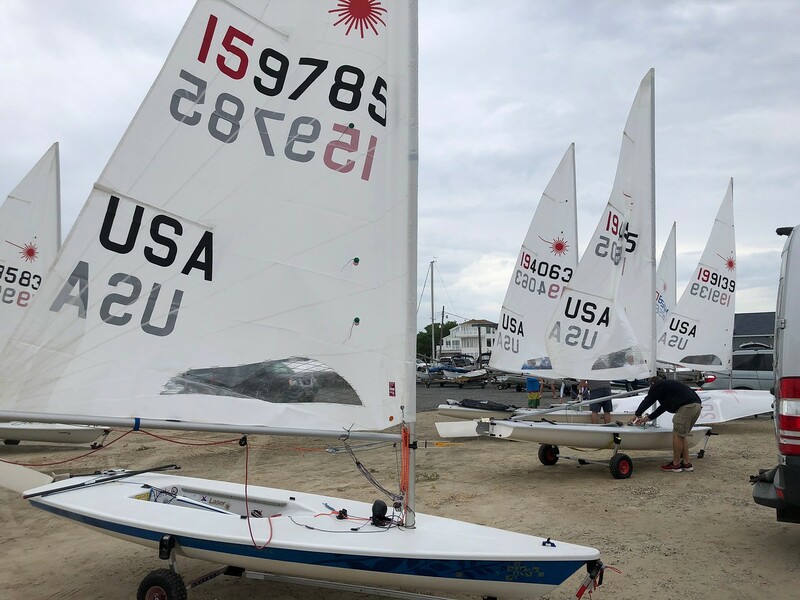 Saturday’s forecast at the US Laser Masters called for more wind even though it wasn’t looking promising in the morning. We went out anyway and it built to 5-10 out of the south. In the first race I had a great start and won the pin. I worked left and found more pressure. At the first mark I was 7th out of 67 boats. 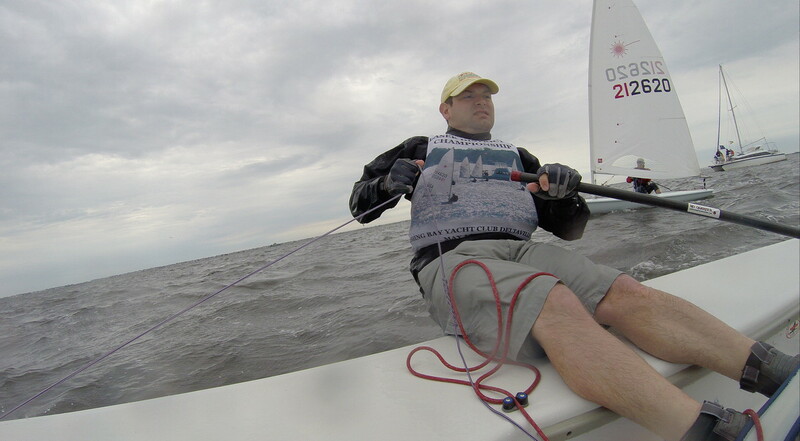 I tried not to loose too many boats downwind and held my own upwind. I ended up 13th. For the second race I had a terrible start and parked it on the line while the fleet sailed away. I was in the 40’s at the top mark. 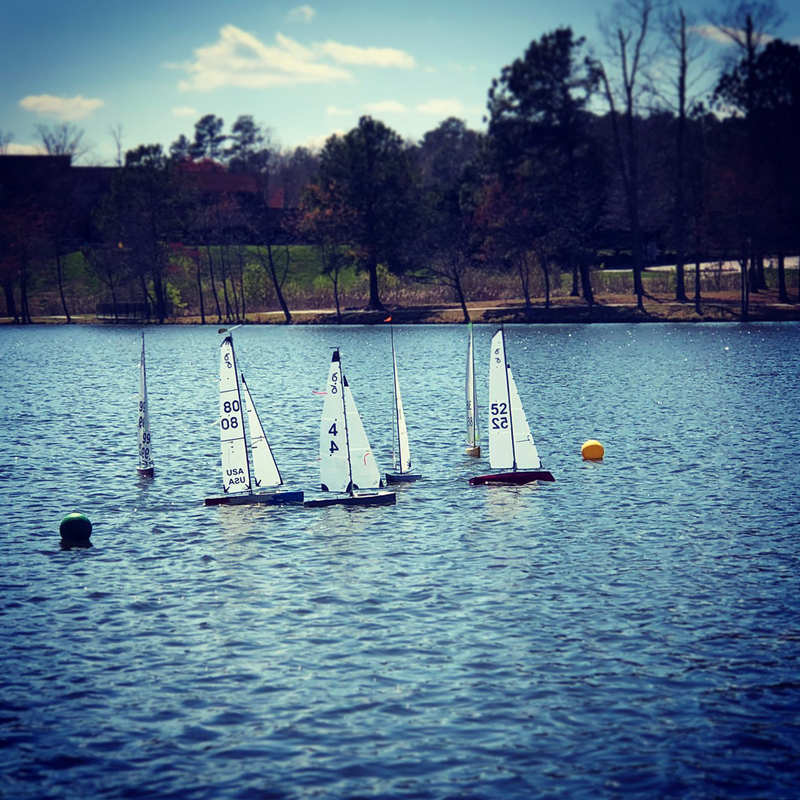 I went low downwind and picked up some boats and on the 2nd beat I picked some shifts up the middle right of the course and passed some more boats. 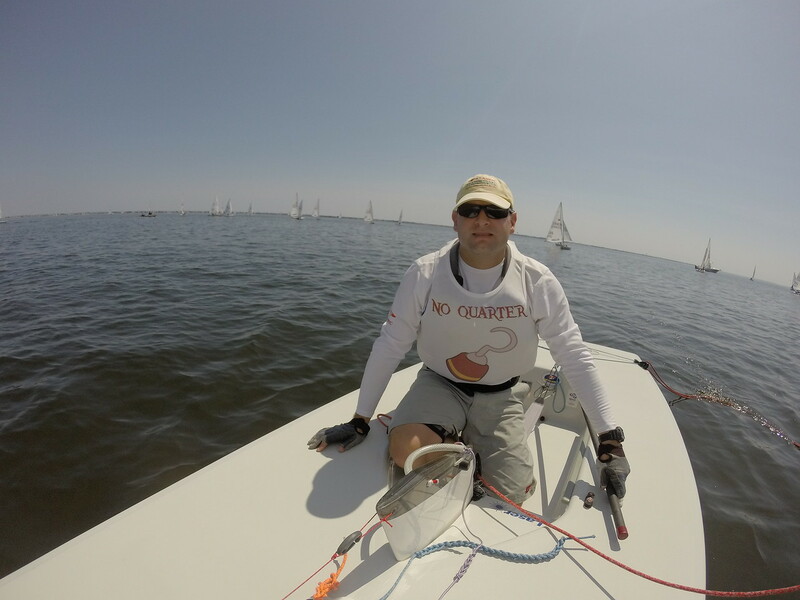 I caught another boat or two downwind and finished 20th. The 3rd race saw me with another terrible start – this time at the boat end. I had a lot of trouble finding clear air and was towards the back of the pack at the first weather mark. Unlike the last race, there weren’t as many passing lanes and I managed a 35th. 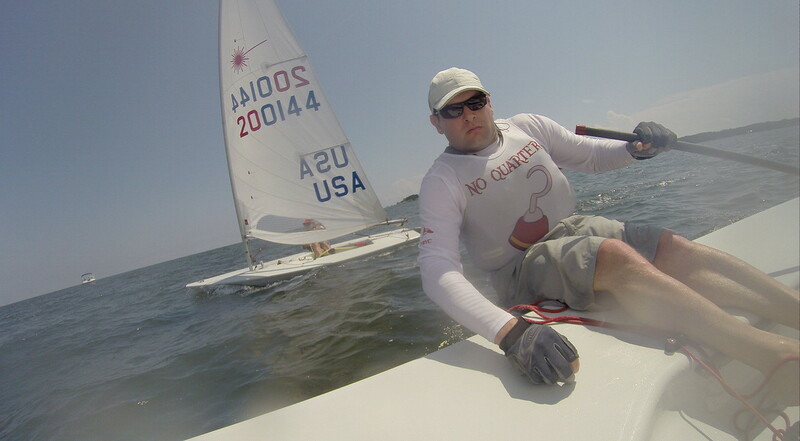 By the 4th race I was tired of sailing in dirty air and determined to get a good start. 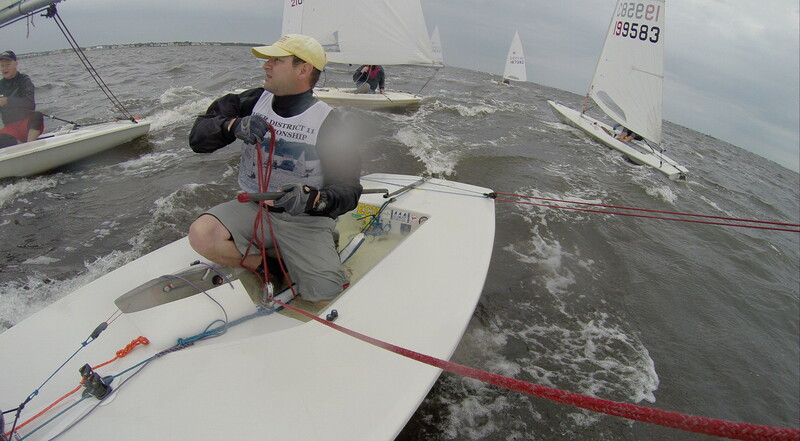 My start wasn’t just good, it was fantastic and I sailed hard to hold my line upwind and stay in the front row. 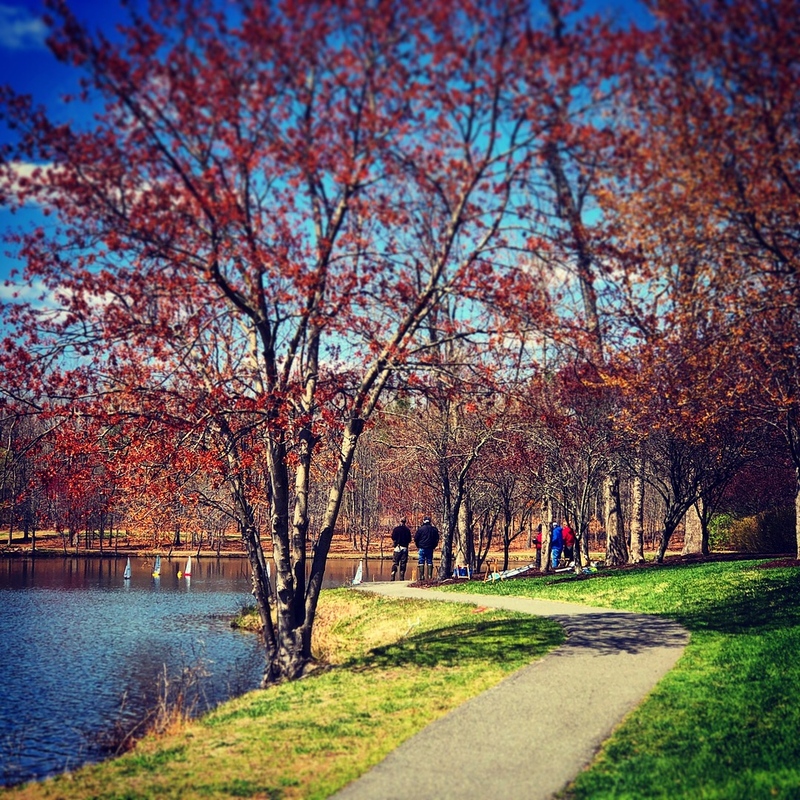 I found my speed to be on par with anyone around me and as we worked our way out to the middle left of the course I found myself crossing fewer and fewer boats and having all the clear air I desired. I was in 3rd at the top mark and sailed just as well if not better downwind by going high and passed another boat by the gate. Upwind I sailed fast, picked shifts, and found myself in 2nd again but to a different leader at the top mark. Downwind I sailed fast but conservatively so as not to do anything stupid. I again went a little high of the guys chasing just to ensure I had clear air. When we came back together, one boat slipped by and I was able to finish in 3rd. It was pretty amazing to hang with some great sailors and gave me a thirst to try and do more of that tomorrow. That got me to 15th overall after 4 races with more planned tomorrow. In masters scoring, my handicap as an Apprentice Master (35-35) means 3 points is added to each race finish. Older sailors get fewer handicap points. That evening I enjoyed another dinner at the club restaurant while we watched the sun set over the water and retired early to rest up for more wind promised tomorrow. 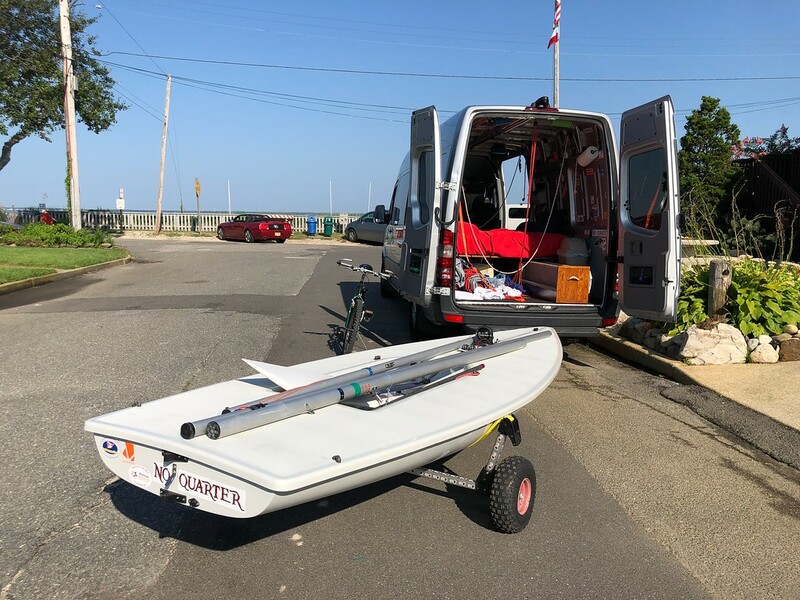 I got a late start out of Richmond on Thursday night and finished the 2nd half of the drive this morning arriving at Brant Beach Yacht Club 45 minutes before the skippers meeting. We ended up being postponed on shore another 45 minutes before finally leaving around 12:30. We would go out and float around another 2 1/2 hours without any wind really filling in. I tried making a GoPro video that made it look as if we really were sailing fast. Kind of glad I did – I took some underwater video and only after reviewing it later did I realize how bad the weeds really were despite not looking bad on the surface. Also note how shallow the bay is. 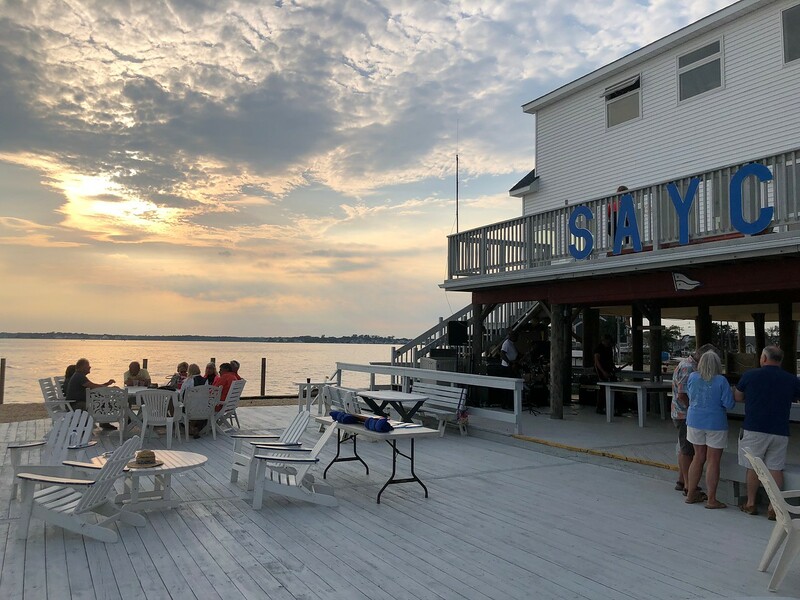 Back on shore the sailors enjoyed a great dinner in the club house and watched the sunset as the club’s A-Cat Raven sailed by. 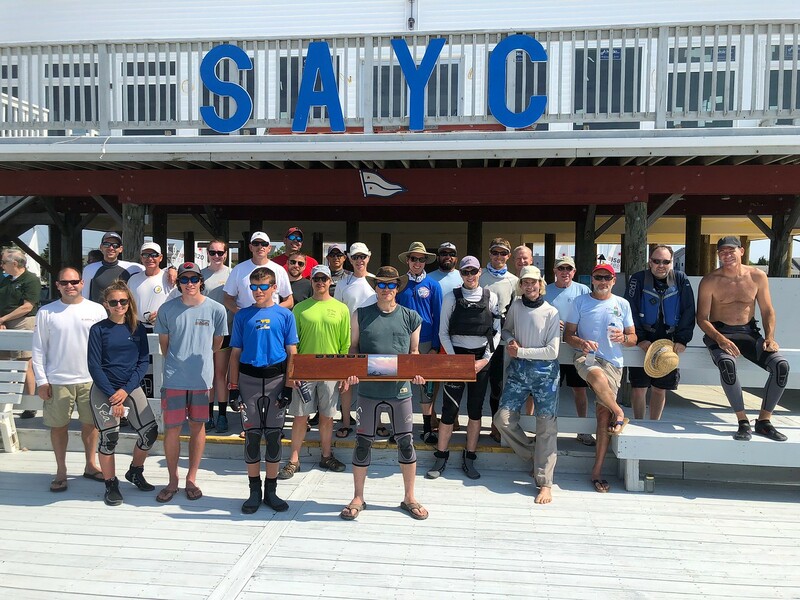 With all the debris floating down the bay from the dam release a couple weeks ago, today’s Smith Point Race at Fishing Bay Yacht Club was moved up to be a morning start so that it could be sailed almost entirely during daylight instead of finishing late at night as it usually does. I sailed aboard Mayo Tabb’s Farr 37 Excitation and we started out with a nice 8-10 knot breeze. After the first two short legs to get out of the river we put up a reaching chute and followed the J109 and J105 and Nanuq flying an asymmetrical spinnaker up the bay to Smith Point against the current. Corryvreckan had a great first 2/3 of the leg leading the J109 Afterthought until Afterthought changed to a reaching kite and pulled back ahead. Excitation was the 4th PRHF-A boat to round and rounded in a little over 3 hours which is very fast for this race. On the trip back south it started closehauled and after about an hour Excitation was the first to put up a chute again. This time we put up a big reaching spinnaker. Nanuq put up their asymmetrical and as the wind died we were able to work around them heading south. 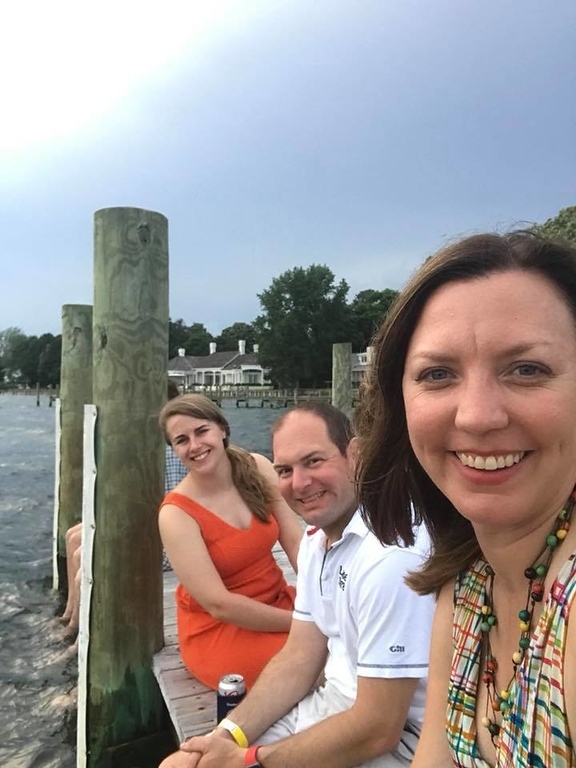 When we got even with Reedville we saw some storms start to pass over Deltaville and the Pianankatank. We took the chute down and put up a heavy #1. We caught the backside of the storms and saw some gusts up to 20 and spent some time getting light rain. We reefed the main and went upwind very well in the conditions and worked our way around both Nanuq and Corryvreckan. Back up the Piankatank for the finish we were 12 minutes ahead of Nanuq and a few minutes ahead of Corryvreckan for a 2nd place overall finished. It was fun racing with Bonnie, Mayo, Chad, Carrie, Dennis and Chris. 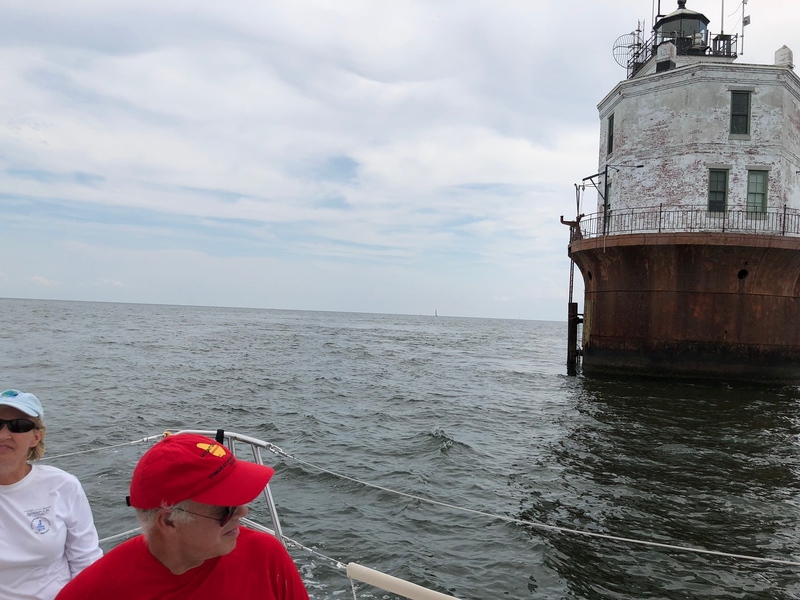 The only casualty on the day was my GoPro camera that got hung up in a line and ripped from the stern pulpit and sent to the bottom of the bay. Beautiful #sunset on #jacksoncreek after sailing to #smithpoint and back. This morning we were greeted to sunny skies and light winds out of the North. 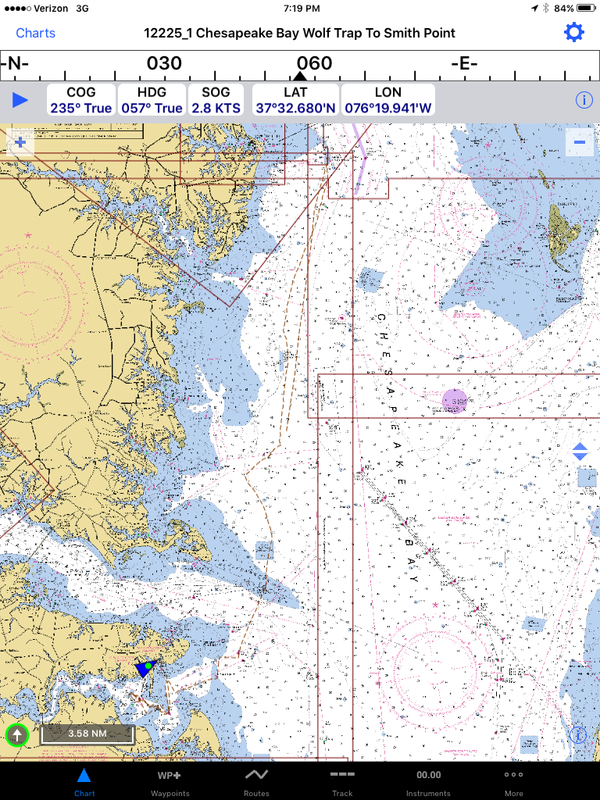 We launched and sailed almost to Gynn’s Island in area C so we’d have the most fetch with a north wind. We got the first race started and just as we were about the start the wind clocked around toward the east and came in a 8-10. The mark was easily fetchable so we had another parade race. There was some passing and it was important to stay as high as possible so as not to be blanketed by the other fleets on the opposite leg. 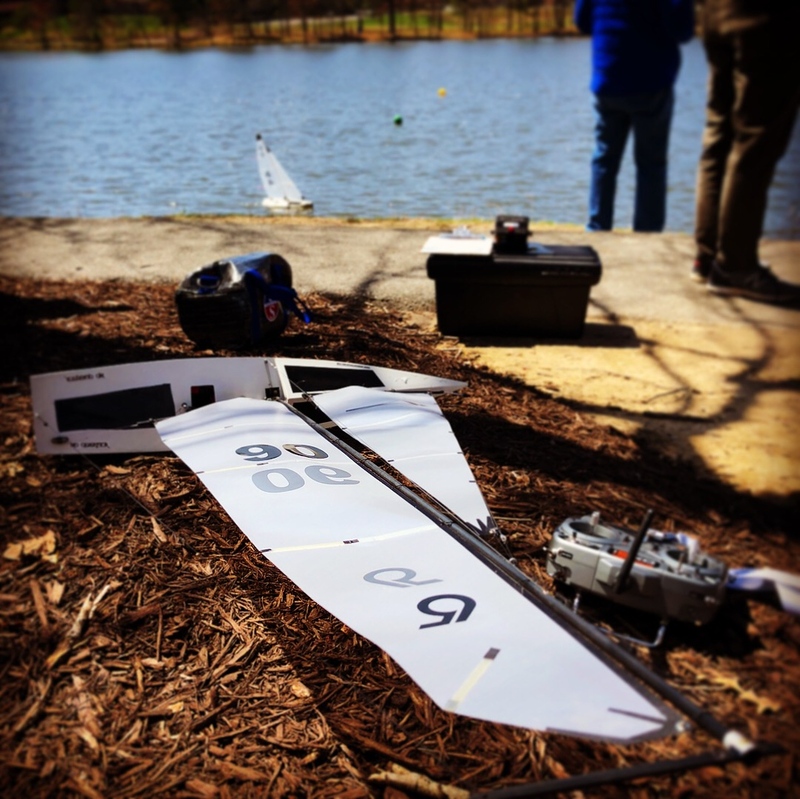 I rounded the first mark in 4th and then made up two spots on the 2nd ‘upwind’ to finish 2nd. 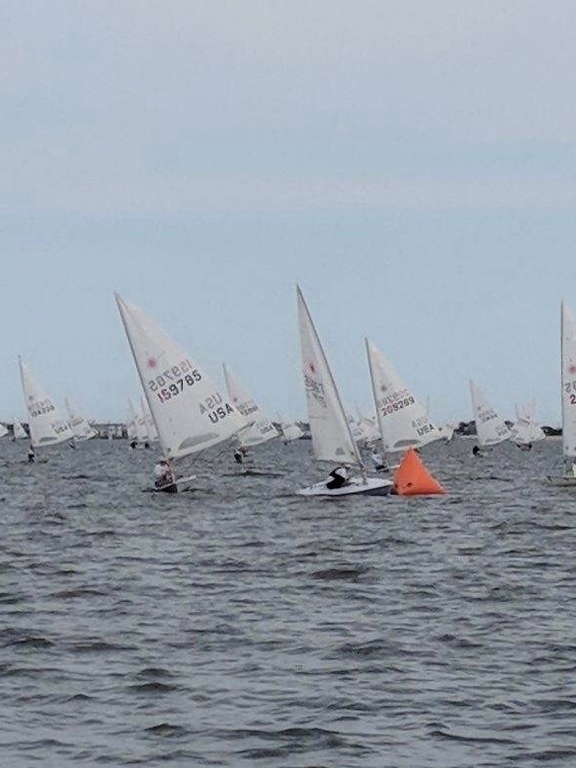 The course was reset for the 2nd race and the wind picked up to 10-14 with some whitecap and small waves. I had a great start, held my lane and used speed and hiking to pull away from the pack a bit. Charlie and David were to leeward going out left as well. About halfway up the beat I tacked to catch a shift to the right and ended up with less air and more headers. Charlie stayed all the way out to the left and came into the windward mark about 15 boat lengths ahead and I was almost as far ahead of David behind me. On the second beat I tried going more left than Charlie, but couldn’t get any shifts and we held our positions for another 2nd for me. That put him 1 point ahead in the lead again. For the 3rd race we had a pile of boats at the boat end for the start. Charlie and I pulled ahead a bit and we rounded 1-2 at the top mark. I stayed within 3 boatlengths downwind and we crossed close a few times upwind before I got a shift out of phase and he put 3-4 boat lengths between us and held that to the finish. 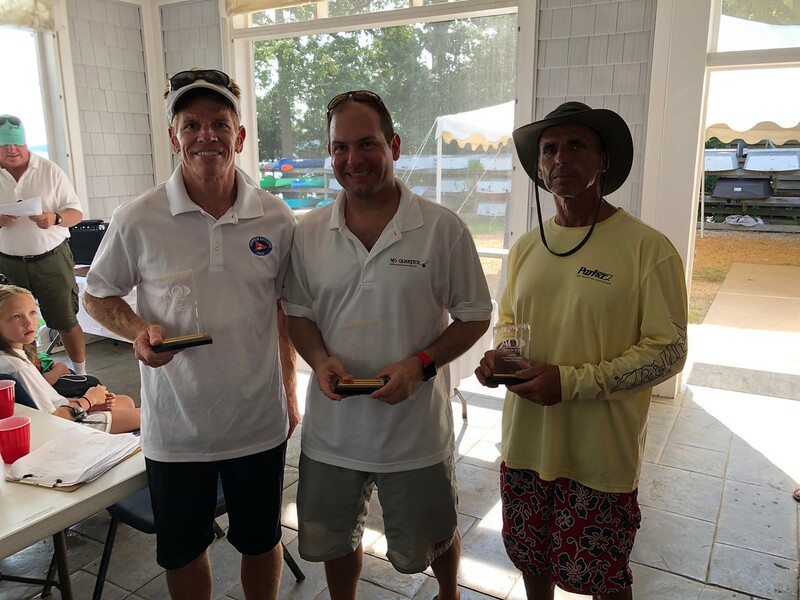 It was great being out on the water – I feel a lot better and up to speed before going to Masters Nationals in Brant Beach in two weeks. Thanks to Rebecca and Massey for organizing the event and to John K and all of the folks on the race committee running the races and marks around. 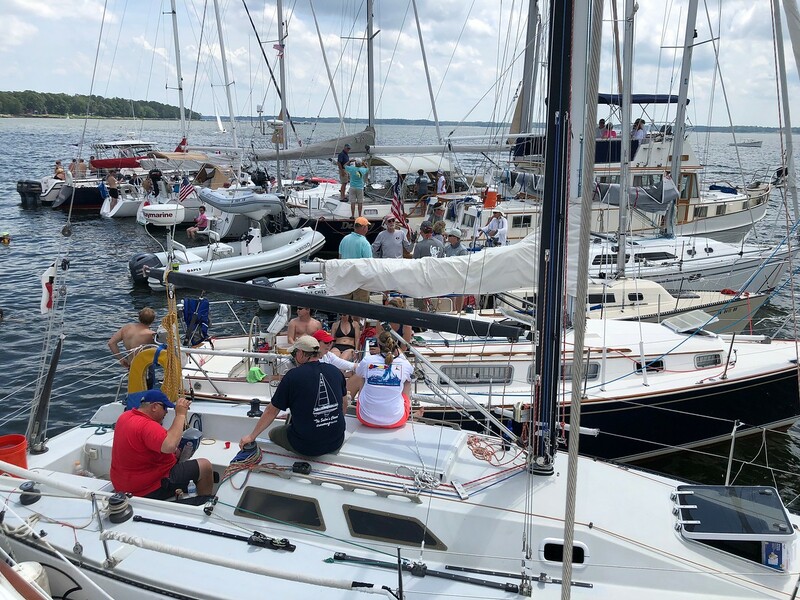 The forecast was pretty dismal for the 79th Annual Regatta at Fishing Bay Yacht Club and we were treated to a nice of weather as we could have gotten – I was expecting cloudy skies turning to rain by the afternoon and didn’t even take sunglasses or sunscreen out. 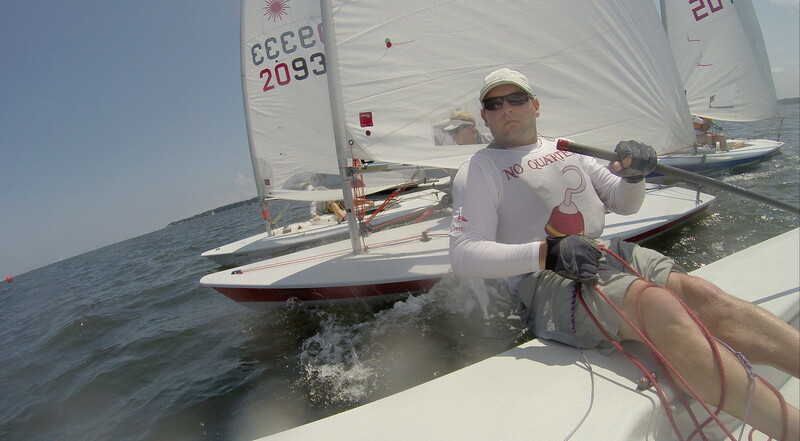 We ended up sailing 4 races in 0-7 and the clouds broke up and gave us some sun before the end of the afternoon. In the first the wind started out more to the west of south and the left side of the course was favored. David went left, while Charlie and I went right. I bailed out halfway up the leg and got somewhat left and managed to round just ahead of Brad. We held our positions downwind and on the second upwind David covered me to the left side of the course allowing Brad to catch a lane out to the right and sail around us. I would end up 3rd. In the 2nd race I had a great start, this time also worked my way a little left and had to pick my way back right. Alain rounded just ahead of me and I followed him downwind. The two of us again went left on the second beat, this time the course was set 10 degrees more to the south. Charlie and Brad were able to sail around us and I finished 3rd again. In the 3rd race the boat was heavily favored, I had a great start and punched out working the middle left of the course. Most of the fleet went way to the left and I found more pressure, less dirty air from the other fleets and a favorable shift at the top mark on the first beat. Charlie caught up to me downwind and we jockeyed at the downwind mark with me just ahead of him. Upwind Charlie split out to the left while I stayed middle right and Mike stayed far right. Mike caught up and crossed ahead and headed to the left while I stayed middle right and again found better pressure and shifts rounding 15 boat lengths ahead and held that to finish 1st. That put me 1 point ahead of Charlie, David and Brad who were all tied for 2nd. For the 4th and final race the wind shifted way right as the race were getting started and it ended up as a parade lap. Those who went high and avoided the other fleet traffic had clearer air and got ahead. The wind for most of this was 0-3 and at one point I think we were making wind by riding the current. I picked up a spot on the final leg and finished 3rd again. Charlie had pulled ahead on the 3rd leg and David squeezed ahead of me. So after 4 races in a regatta with no drop races, Charlie is 2 points ahead of me and David who are tied.